We talk often about how different Walt Disney World was during its early years, or even how each park greatly differs today from the park that greeted guests when it opened. Sometimes we long for those early days, sometimes it is only a matter of preserving the history of a place, occasionally it is a bit of both. Take for instance this vista of China from the shaded alcove near Germany in 1982. This isn’t a view that is accessible today. For starters, there is no sign of Norway which was still the better part of seven years away from being opened. Yet, even China itself wasn’t the pavilion we know today. 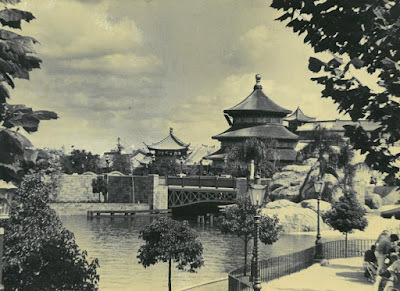 In 1982, the China pavilion featured the gardens, significant architectural representation of noted locations in China, and the film The Wonders of China. The gallery next to the theater would open in 1983, but we can still see that structure here. The noticeable difference is that Lotus Blossom Cafe, Nine Dragons Restaurant, and House of Good Fortune are all missing. In fact, these locations wouldn’t become part of the World Showcase skyline until late in 1985. The China pavilion, as a whole, hasn’t seen that much in the way of change over the years, but for a time there was much less to do than there is today. Still, regardless of the era, the gardens there are some of the finest in World Showcase. Even just the glimpse of them here is calming.